Something weird happened this weekend. And I’m not talking about my being attacked by an alien Elvis impersonator in a Gorilla suit. I’ll tell you kids that story some other time. What happened was this: I was checking the sales numbers for my books in the Kindle store. (I know Bob Mayer says that doing this too often means you’re taking your eyes off the long road, but it’s all so shiny and new right now it’s hard to keep myself from checking at least once a day. And that’s okay because I’m pretty sure I’ll grow out of it, just like I grew out of compulsively checking my blog stats every fifteen minutes.) Anyway, the last time I checked I had sold exactly five of my new scifi/horror short story “Derelict.” But when I checked my numbers on Saturday night that number had shot up to twelve hundred. And what do you know, good old dad was right. Because when I checked my Amazon page I saw that my ebook, which had been listed at the bargain-basement price of ninety-nine cents, had been marked down into the sub-basement of freebies. At first I was angry. Because hey, this was my story and they were just giving it away? Without my permission? And then I remembered another wise thing my dad once said: “Always read the fine print.” So I did. And lo and behold, I found out that Amazon has every right to take your story and mark it down to whatever price they feel like. Gradually my anger faded and was replaced with a heaping dose of pragmatism. I learned two things that night, things that my fellow authors would do well to keep in mind especially if they plan to ever go the indie/guerilla/self/gorilla-publishing route. 1. Amazon is large and in charge. Seriously people, the Kindle is it right now. I’m sure some of you out there love your Nooks, and for what it’s worth I don’t own either, but from my side of the equation I can tell you that I’m selling way more ebooks through Amazon than anywhere else. Which means that Amazon can basically afford to do whatever they want to do and you’ve just got to sit there and take it. Sure you can go out and whine and moan about how big they are and how its not fair, but none of that really matters. You’re in the game, and these are the rules. Maybe they aren’t “fair” but that doesn’t give you the excuse to stop playing to win. 2. Free stuff is the best publicity ever. I want to reiterate something I said at the beginning of the post. Before, my story was in the hands of a total of five people. At this point it’s in the hands of nearly two-thousand. Now sure, some of those people only downloaded the story because it was free. Maybe they won’t ever even get around to reading it. But now I have two five-star reviews on that story, where before I had none. And the odds are good that if people like my writing, some of them will check out my other ebooks. And having my story move so many copies so fast has done wonders for it’s ranking. So yeah, maybe I’m just being a Pollyanna here but I see some huge potential upsides to all of this in the long run. And it is a long run. So I’m gonna pace myself, and keep doing my best. Because, honest success doesn’t come overnight. P.S. You really should go and check out Derelict if you haven’t done so already. You’ve got no excuses now, and I really think you’ll like it. If you do like it, maybe you would be inclined to write a review? So apparently…good things come to those who wait. And wait. Good things also come to those who hit the refresh button over and over and freak out until they make themselves sick. I’ll let you guess which one I am. Yes, that’s right A Prairie Home Apocalypse or: What the Dog Saw just went live on Amazon. It’s possible that you may be wondering: “Is this book really for me?” If you are I have compiled a helpful reference for your edification. The following is a list of the types of people who may find my book interesting. Come on folks, give it up for man’s best friend. Not only are they kind and loyal, but they don’t look down on you like those uppity cat things. Seriously. How can you say no to that? You know the ones. The walking dead, those lovable reanimated rotting corpses that just want to have a little nibble of your brains. They waltzed their way into the popular imagination with George A. Romero’s classic Dawn of the Dead, and we haven’t looked back since (except of course to make sure none of them were following us home). Because um…maybe things might not go very well for our lovable fury protagonist? Maybe you can’t stand zombies. Maybe just thinking about dogs makes you itch. Maybe you don’t want to read a groundbreaking work of literary fiction that reimagines the zombie horror genre in a different light. Maybe you just want to an awesome dude how much you like him. Or you can just show me, and I’ll make sure some sufficiently awesome dude hears about it later. If you fall into any of these categories then I’d suggest that you check out my book. At this very moment it is available for Kindle only, but I’m working diligently to get it up on Smashwords for those of you who happen to have something other than a Kindle (I’m one of these people so I feel your pain). Also, if you happen to like the book, please help me spread the word. Tell a friend, tweet about it, “Like” it on Facebook. If you do the blog thing, then I’d love to do an interview. Community is the only advertising strategy I can afford. But I’m betting it’s the best there is. And again, to all of you who have already been so supportive of me and my project…thank you. Thank you from the bottom of my heart. A picture being worth a thousand words, I thought I might just post this and be done for today. It was created by John Hornor Jacobs of atomictomato.com. If any of you are looking for cover work for your selfpub ventures, I cannot recommend John highly enough. He responded to my inquiry quickly and finished the work in an extremely timely manner. Also (and this is the big one for me) his price is accessible for even a lowly Walmart associate like me. Bottom line, I’m rather pleased with the result. You can see more of John’s cover work here. And don’t forget! A Prairie Home Apocalypse or: What the Dog Saw will be going on sale for Kindle (and other eBook device thingies) on Tuesday. Tell your friends. 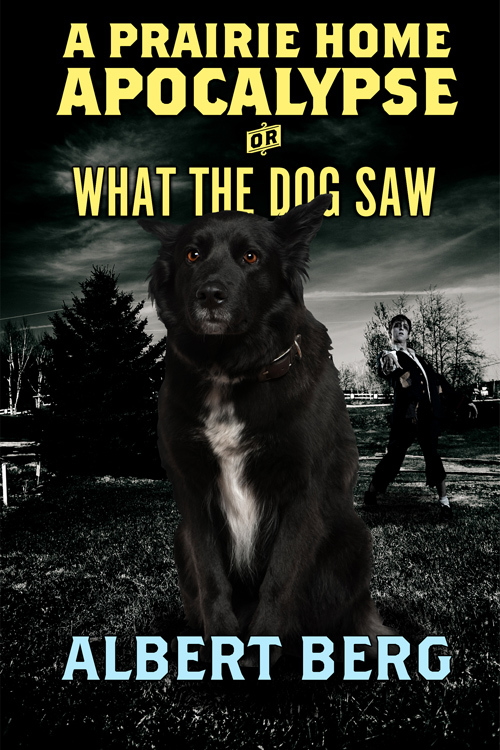 If your friends aren’t interested in reading a book about a dog facing the zombie apocalypse, then club them over the head with a brick and steal their credit cards so you can buy one for them anyway. Okay, okay! Keep your britches on! Anyway. The Great Jacqueline Howett Meltdown got me to thinking: Jacqueline Howett is a person. Which hopefully everyone knows. I mean no one thinks she’s some kind of alien robot sent to sow discord on the internet or anything like that. But sometimes even though we know we don’t really know. There’s something about distance that keeps us from seeing other people as real people. I still remember the moment when as a child we were driving down the road and I looked out at all the other cars and realized that each and every one of those people had a life every bit as real and full and complex as mine. But I also realized it was easy for us to ignore that fact because each of us was encapsulated in our own little climate controlled pod on wheels with the radio on, drowning out the our thoughts, letting us think we were the only real people in the world. The internet is a lot like that too. Each of us sitting here at our own glowing screen interacting with others, but not really grasping the fullness of the truth that all those other words represent living, breathing, hoping individuals just like us. I’m not here to defend Ms. Howett. I’m just here to remind you that she’s a person. She is more than the sum of her words. Writing a book, even a bad one full of mistakes and errors is a lot of work. If you don’t believe me you should try it some time. And especially that first book…that sucker is like pulling teeth and giving birth at the same time. And when you’re finally done you print it all out and look at it in all of its grandeur and you think, “This is possibly the greatest thing I have ever done.” And you know what? For most of it, it probably is the greatest thing we’ve ever done. And then someone comes along and shoots it full of holes. It’s easy to make that person into the enemy. Because that criticism can hurt, especially at first. It doesn’t matter if it’s right or not. It doesn’t matter if the person giving the criticism is trying to help. It still takes a knife and shoves it right through our ego. Like I said already, I’m not here to defend Ms. Howett. What she did was wrong on any number of levels. I was going to talk about agents today. I was going to whine and complain about how condescending they sometimes seem and how that sometimes it feels like they view us authors as tiny little word machines whose only purpose in life is to churn out predictable and easily classified stories for them to put next to other predictable and easily classified stories for the easy sale. But you know what? Forget about that. Just because I got all riled up last week because of some agent’s condescending blog post doesn’t mean I need to transfer all that frustration to you. So instead I’m gonna talk about smells. Huh. That sounded kinda wrong. How about scents? “I’m gonna talk about scents” sounds better right? Specifically I’m talking about the smells of books. Have you ever smelled a book? Ever stuck your nose in its pages and breathed in its essence? Oh. Well, maybe I’m the only one then. That would certainly explain all the strange looks I get at the bookstore. But I’ve noticed that each one is unique. Each book carries it’s own special perfume. Sometimes its a subtle smell, a whiff of ink and glue and the crisp perfume of clean paper. But other times it’s a stronger, more pronounced, almost acrid smell especially with old books where the paper is starting to brown and the edges of their covers are starting to fray. No two of them are ever quite the same. Sometimes I like to imagine that each book’s individual smell is like a secret code, and if I knew the code I could absorb the story simply by breathing it in. That’s one thing eBooks will never have. I’ll never be able to take my eReader and breath in the smell of history on a particularly old book or the scent of barely-dry ink on a new one. Don’t get me wrong. I love eBooks. But I don’t think I’ll ever get over holding a real book with real pages in my hands either. Somewhere along the way, ink and paper combine together. The ink has no understanding of the words it has been entrusted to convey. The paper has no consciousness of its precious cargo. But somehow these two unwitting accomplices work together to create something of meaning. A memory, a story, a shard of the author’s soul. It’s a kind of magic in its way. And I’ll never stop believing in it. I’m not sure why “weird” isn’t a genre by now. If I was running a book store it would have a section labeled “Weird Stuff,” You’d go over there and find books like Three Bags Full, House of Leaves, The Beasts of New York, and the Thursday Next Series. 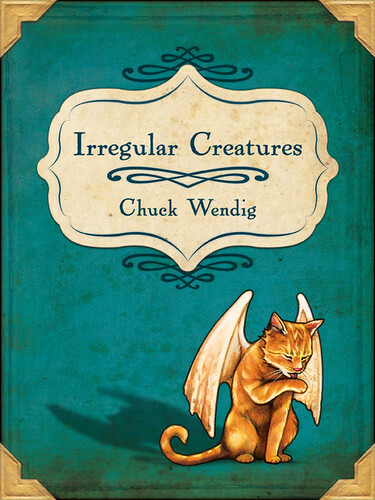 And if you went a further down the row, nestled somewhere between Buddy Holly is Alive and Well on Ganymede and When Graveyards Yawn you’d find a little book by Chuck Wendig called Irregular Creatures. Reading this book was a strange experience for me. See, when I was a kid we used to go to the creek and swim. I remember dipping my toe into the freezing water, and then my feet, and then my legs. Finally, I’d take the plunge and sink my whole body into the water. After a minute or two I was wondering why I had been so freaked out by a little cold water. There are books that you will read for the sheer beauty of the sentences, the perfect poetry of the prose. This isn’t one of those books. This book takes every hint of artificial adornment and crushes it beneath its hobnailed boot; it spits upon subtlety, and gleefully defenestrates that worn out old saw that the writer must show and not tell. When Chuck Wendig wants us to know that he hates Mondays he writes, “I [bleep]ing hate Mondays,” and moves on with the story. And I for one am fine with that. In fact that’s part of the beauty of this book. Because what Wendig has to say is far too important to let it be overshadowed by how he says it. It is clear from the get-go that the stories are the stars of the show in this book and they are amazing. I will not do you the disservice of summarizing the tales, but I will say they’re probably unlike anything you’ve ever read. The best of the bunch is a tiny tale called “Beware of Owner.” Reading this story is like having someone slide a rusty machete into your belly and then twist it hard. And I mean that in a good way. The other stories are good too, though some better than others. One in particular, “The Auction” had a fantastically well-developed setting that felt as if it could contain an entire novel’s worth of action, but the story itself didn’t quite live up to the incredible world that had been created for it. Also when reading “Lethe and Mnemosyne” I got slightly confused. Even after looking up the mythological characters of the title I still didn’t get what any of it had to do with a giant killer chicken. If any of you know I would love to be enlightened. Irregular Creatures will take you on a journey you will never forget. Still don’t believe me? Seriously? I’m hurt. Okay, well if you need extra incentive, you can check out some of the stories from this book including my favourite, “Beware of Owner,” here. Once you’ve gotten the cat feathers out of your brain you can buy the Kindle version of the book from Amazon.com here or the PDF direct from the author’s website here.